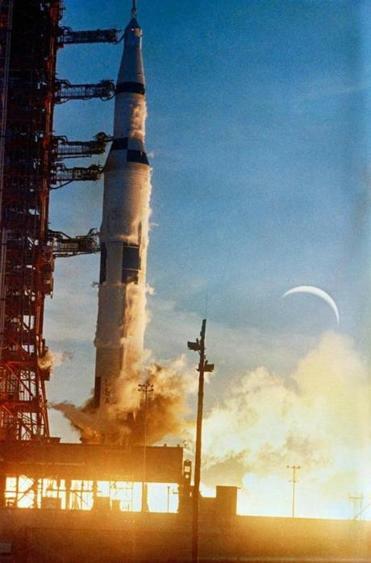 The Apollo 8 space vehicle was launched from the Kennedy Space Center on Dec. 21, 1968. As a number of published accounts of the mission have noted, going to the moon hadn’t been the original plan for Apollo 8. It was initially supposed to be a flight only to low earth orbit, where the crew could start getting used to NASA’s new lunar module, and run through simulations of re-entering earth’s atmosphere after a lunar voyage. Then everything changed. In September, the Soviet Union launched an unmanned lunar probe, Zond 5, which successfully orbited the moon and returned to earth. The CIA reported the Soviets might be planning a manned mission by the end of the year. America’s shot at winning the space race, and of achieving President Kennedy’s goal of landing an American on the moon before the decade’s end, seemed to be slipping away. Whereupon, in a surge of audacity and élan, NASA switched gears. With barely four months to make it happen, the decision was made to send Apollo 8 to the moon. The risks were enormous. No one had ever traveled more than 850 miles from the earth’s surface; Borman, Lovell, and Anders would have to fly 240,000 miles to reach their destination. It would require the most powerful rocket ever built, the Saturn V, to propel Apollo 8 beyond earth orbit. But Saturn V was new and had never flown a manned crew. In fact, it had only been tested twice — and the second test, in April, had gone very badly. Even more unnerving was that Apollo 8’s new lunar module, plagued by defects, still wasn’t ready. That meant the crew would have no backup engine: no lifeboat. There would be only the single engine of the command module, which would be needed repeatedly — to fly to the moon, to enter lunar orbit, to escape from the lunar orbit, and to return to earth. If that engine failed, the astronauts would be doomed. The death of astronauts was no mere theoretical concern. In January 1967, an errant electrical spark had triggered a flash fire that destroyed Apollo 1 during preflight testing, killing three astronauts. If ever fortune favored the brave, it favored NASA and the crew of Apollo 8. Borman, Lovell, and Anders became the first men to leave earth’s gravitational field, the first to travel through a quarter of a million extraterrestrial miles, the first to see the dark side of the moon, and the first to see the heart-stoppingly gorgeous view of an earthrise from outer space — to see the Earth, in Borman’s awestruck formulation, the way God must see it. They weren’t the only ones overcome with emotion. The astronauts’ words could not have more perfectly suited the moment. Fifty years ago this week, at another time when Americans and so much of the world were riven by turmoil, anger, and mistrust, Apollo 8 had found a way to remind earth’s residents that what unites them is far more profound and enduring than what divides them.